Recent maritime disputes, environmental disasters, and piracy have raised the profile of the law of the sea. This Oxford Handbook brings together high-level analysis of all of its key aspects, examining the role of particular regions in the development of the law of the sea, mana... read full description below. Edited by Rothwell, Donald R.
Edited by Scott, Karen N.
Human activities have taken place in the world's oceans for most of human history. With the oceans being used for trade, being exploited for fisheries and mineral resources extraction, and becoming the focal point for security crises, the legal regime regulating the rights and responsibilities of nations in their use of the world's oceans has long been a crucial part of international law. The United Nations Convention on the Law of the Sea comprehensively defined the parameters of the law of the sea in 1982, and since the Convention was concluded it has seen considerable development. This Oxford Handbook provides a comprehensive and original analysis of its current debates and controversies, both theoretical and practical. Written by thirty nine expert contributors, the Handbook sets out how the law of the sea has developed, and the challenges it is currently facing. 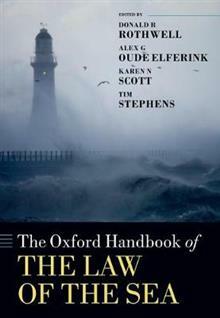 It is an invaluable and thought-provoking resource for scholar, students, and practitioners of the law of the sea. Donald R. Rothwell is Professor of International Law at the ANU College of Law, Australian National University, Australia where he has taught since 2006, and was previously Challis Professor of International Law at the University of Sydney (2004-2006). His research areas include the law of the sea, the law of the polar regions, international security law, and international law in Australia. He is author, co-author, and editor of 16 books. Alex G. Oude Elferink is Deputy Director of the Netherlands Institute for the Law of the Sea at the School of Law, Utrecht University, The Netherlands. His research interests include the law of the sea, the law of the polar regions, and the relationship between international law and international relations. Karen N. Scott is a Professor of Law at the University of Canterbury, Christchurch, New Zealand. Her research interests include Antarctic law and policy, the law of the sea and international environmental law. She is the editor of the New Zealand Yearbook of International Law and a member of the Advisory Board to Gateway Antarctica at the University of Canterbury. Tim Stephens is Professor of International Law and Australian Research Council Future Fellow at the Sydney Law School, University of Sydney, Australia. He is President of the Australian and New Zealand Society of International Law.